Fluffy, sweet, and delicious—pancakes are the type of breakfast food you enjoy on a lazy weekend morning. They're simple and quick and they're the ultimate comfort meal. Whether you like yours topped with fresh berries and bananas or loaded up with chocolate chips and powdered sugar, Florida's lovely pancake spots are up to the task. Here are our favorites in the state. Tucked inside the DeLeon Springs State Park, this pancake house is one of Florida’s best kept secrets. This 100-year-old restaurant is set inside a replica of the old sugar mill from 1830. Griddles are found at every table so you can cook your own pancakes to perfection, just the way you like them. This offbeat restaurant is an experience unlike any other. 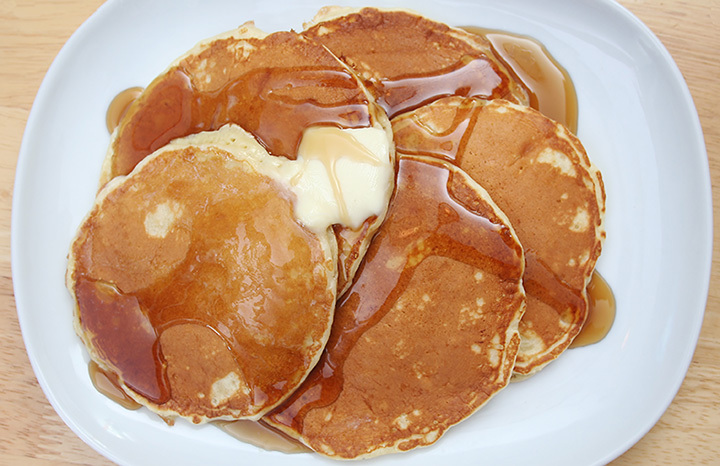 Pancake lovers can purchase batter by the bottle and cook them on their own personal griddle at their table. They offer all the toppings you can imagine, like peanut butter, Nutella, marshmallows, and strawberries, along with whole wheat and gluten-free varieties. Tourists agree that no vacation is complete without a trip to the Pancakery. Gourmet pancakes come piled high with fruits, whipped cream, chocolate, bacon, and even ice cream. Every pancake dish looks more like a work of art, almost too good to eat. This Gulf-front cafe is the stuff dreams are made of. They're well-known among locals and travelers alike for their all-you-can-eat pancake breakfast, and you might just want to stay all day and savor these delicious pancakes. You also get stunning views of the Gulf of Mexico while you eat, just another reason for you to sit and stay awhile. You won't find pancakes like this anywhere else in Florida. Skip the griddle and head straight for these cast iron baked pancakes, made with organic flour and real Vermont syrup. Then finish them off with a topping of fresh fruit or Belgian white chocolate and ice cream. These aren't your typical pancakes, and you'll be glad to venture off the beaten path once you see what they've got cooking. Cinnamon roll pancakes, potato pancakes, and red velvet pancakes have earned them quite a bit of notoriety in the state. Even better, their pancakes are huge and served all day. This place changes everything you thought you knew about pancakes. With varieties like pecan, chocolate chip, blueberry, and banana, your pancake breakfast also doubles as your dessert. It just doesn't get any better or more satisfying than this. Their sweet potato biscuit isn't the only thing this place is famous for. This family-owned restaurant combines traditional Mexican fare with American breakfast items for a fusion you've never experienced anywhere else. Get them plain or top them with blueberries, each one just as delightful as the other. If you love the idea of dessert pancakes, this place was made for you. Favorites like Nutella pancakes, M&M's pancakes, Reese’s peanut butter pancakes, and fresh fruit pancakes give you something worth savoring. You won't find a more delicious pancake lineup anywhere else in Florida. This tiny breakfast house has some major awards under its belt, including the best breakfast in Orlando. So it's no surprise they have equally amazing pancakes to start your morning off right. Classic, blueberry, and banana pancakes give you a simple and delicious breakfast that makes waking up early worthwhile.